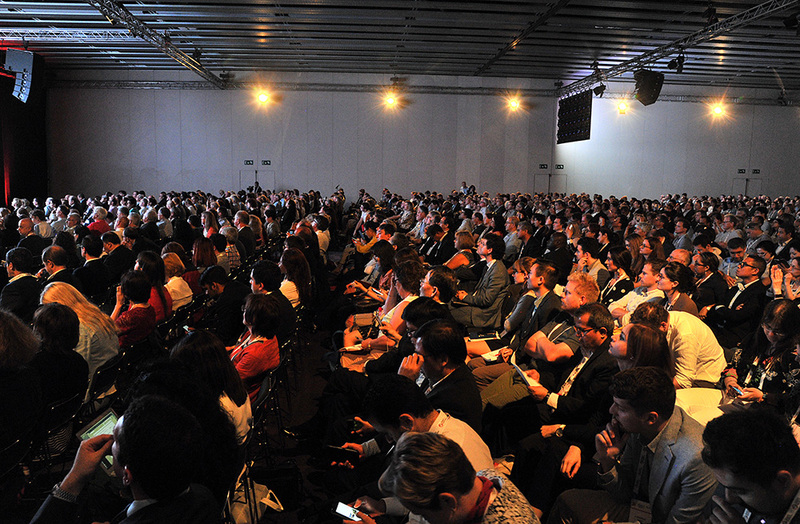 The European Society of Hypertension (ESH) developed an outstanding scientific programme, that included multiple State-of-the-Art Lectures, Debates and Round Tables on issues on major current interest and controversy. As in the past, the program reserved a wide space to the practical aspects of the management of hypertension via Teaching, How-to, Meet the Expert and Clinical case sessions as well as via sessions reserved to hypertension specialists and ESH Excellence Centers. An important contribution also came from Satellites organized by the Industry. This international meeting will enhance your practical and theoretical knowledge and provide you with the unique opportunity to network with a wide range of professionals in the field of Hypertension and Cardiovascular Protection. Satellite Symposia – coverage of the Satellite Symposium presented during ESH 2018. Meeting Abstracts – the ESH 2018 Meeting Abstracts of Posters and Oral Sessions from the Journal of Hypertension are now available! Interviews – interviews with ESH Leadership. Awards – awards conferred during the ESH 2018 Annual Meeting. 2018 European Guidelines – Webcast presentations are available. 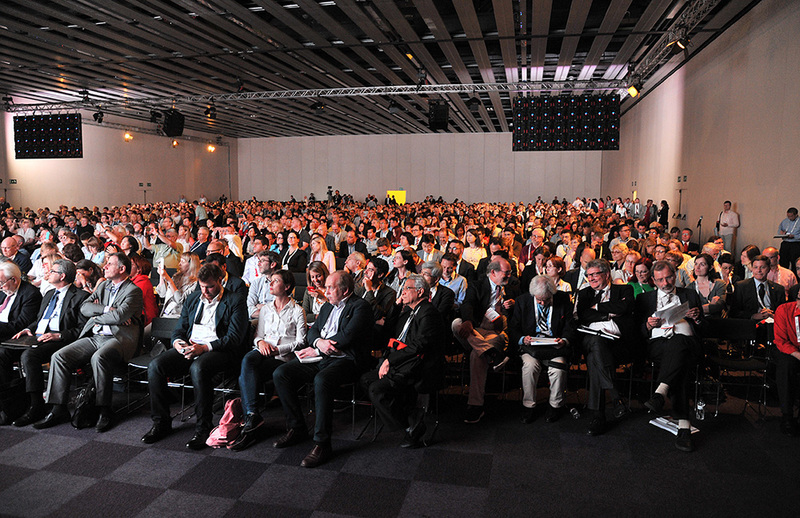 From June 8 to 11, the 28th Annual Meeting on Hypertension and Cardiovascular Protection of the European Society of Hypertension (ESH) was held in Barcelona, Spain. 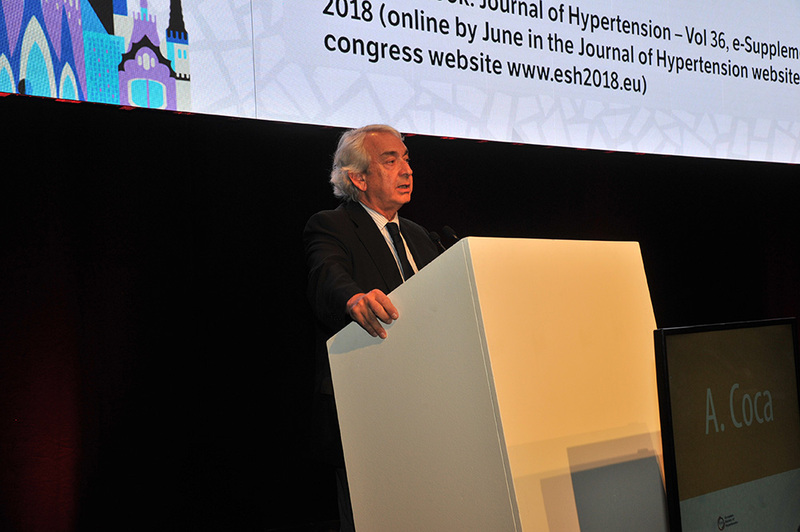 More than 2,700 hypertension specialists from Europe and the rest of the world attended the 2018 congress and enjoyed the state of the art presentations of European and all over the world experts. The scientific program covered more than 100 sessions on recent topics in hypertension and associated diseases. Some of the sessions were organized as Joint Sessions with other Societies (Table 1). Special sessions were dedicated to practical aspects of hypertension management via Teaching, How-to, Meet the Expert and Clinical case sessions. 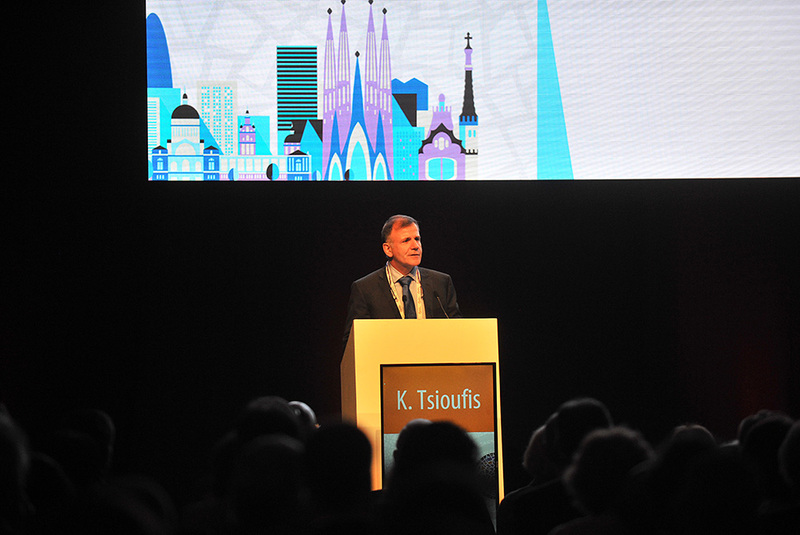 During the opening session Prof. Josep Redon, Honorary President of the congress, Valencia (Spain), Prof. Antonio Coca, President of the Congress, Barcelona (Spain) and Prof. Konstantinos Tsioufis, President of ESH, Athens (Greece) welcomed the attendees to the meeting in Barcelona. In addition, a brief but moving eulogy for Prof. Alberto Zanchetti was given by Prof. Giuseppe Mancia, Milan (Italy). Prof. Zanchetti, a Past-President and honorary member of ESH, passed away at the age of 91 years in Milan on March 24thin 2018. Prof. Zanchetti was the driving force behind the ESH and its activities included the joint ESH/ESC Guidelines on Hypertension, which he first inspired in 2003. He was chief editor of the Journal of Hypertension since 1995. The most important highlight of the congress was the first presentation of essential recommendations of the 2018 ESC/ESH Joint Guidelines on the Management of Arterial Hypertension. More than 1700 individuals in the auditorium and more than 2000 via live streaming webcast attended the main session dedicated to this presentation. 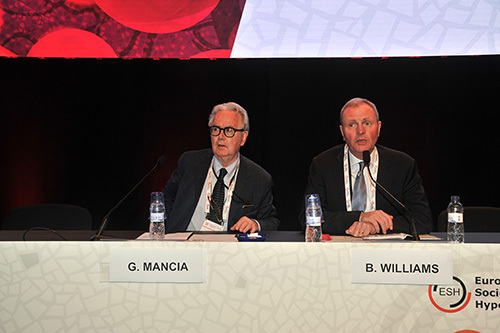 This session was a great success and was chaired by Prof. Bryan Williams, London (UK), and Prof. Giuseppe Mancia, as the two chairpersons and leading authors of the guidelines. The full text of the new joint guidelines (was) subsequently published in the European Heart Journal (1) and Journal of Hypertension (2), the two official journals of ESC and ESH, respectively. One of the most important statements of the guidelines and eagerly awaited by the audience was related to the definition of hypertension. Prof. Krzysztof Narkiewicz, Dansk (Poland) confirmed in his presentation that hypertension is still defined as office systolic blood pressure (SBP) values ≥140 mmHg and/or diastolic blood pressure (DBP) values ≥90 mmHg. This topic was of major interest based on the background of the recently presented 2017 High Blood Pressure Clinical Practice Guideline released by the American College of Cardiology (ACC) and the American Heart Association (AHA). In this guideline hypertension was defined with cut-off values of SBP of ≥130 mmHg and/or DBP of ≥80 mm Hg. Prof. Paul Whelton, the leading author of the 2017 ACC/AHA guideline, presented the rationale for their view and engaged in a debate on the “Definition of hypertension in 2018” with Prof. Mancia. However, both guidelines recommend a wider use of out-of-office BP measurements with ambulatory BP monitoring (ABPM) and/or home BP monitoring (HBPM); especially HBPM, as an option to confirm the diagnosis of hypertension, detect white-coat and masked hypertension, and to monitor BP control is encouraged. In a corresponding lecture, Prof. Thomas Lüscher, London (UK) asked in his stimulating talk the question “What is a Normal Blood Pressure?.” He covered a wide range of aspects including his personal view on a personalized medicine approach to tackle this issue. New target ranges for BP and a single pill combination (SPC ) treatment strategy to improve BP control represent two innovative concepts in the new European guidelines. Prof .Mancia explained that the guidelines recommend target BP ranges for treated patients to better identify the appropriate BP target and lower safety boundaries for treated BP, according to a patient’s age and specific comorbidities. The above recommendations were mostly driven by the large series of meta-analyses by C.Thomopoulos, G.Parati and A.Zanchetti. Prof B.Williams highlighted the preferred use of two-drug combination therapy as a SPC for the initial treatment of most people with hypertension aiming to improve BP control. The issue of seasonal variations in BP in response to environmental changes in temperature was discussed during the congress by a group of ESH BP monitoring experts chaired by Professor George Stergiou, Athens (Greece). He concluded that recommendations are needed for practicing physicians on how to select cases in whom treatment modification is necessary.Recent data from the Primary Aldosteronism Surgery Outcome (PASO) study were presented and discussed by Prof. Paolo Mulatero, Turin (Italy) and Prof. Jiri Widimsky, Prague (Czech Republic). The PASO investigators showed that compared with a diagnosis based on adrenal venous sampling (AVS) a diagnosis with computed tomography (CT) decreases the likelihood of biochemical cure following treatment by adrenalectomy, which has a negative impact on clinical outcomes. Prof. Widimsky, chair of the ESH Working Group (WG) on Endocrine Hypertension,concluded that AVS should be performed in all patients with primary aldosteronism in whom surgery is feasible and desired by the patient, because the correct diagnosis and treatment of patients with unilateral forms offers a potential cure and the possibility to avoid comorbidities. During the congress the ESH WG on Interventional Treatment of Hypertension focused on the new positive results of renal denervation trials (SPYRAL HTN ON MED and RADIANCE SOLO). Prof. Roland E. Schmieder, Erlangen (Germany) as the chairperson of the WG said ”we have now a solid proof of evidence that renal denervation lowers BP in hypertensive patients. Several studies with larger populations in hypertensive patients with uncontrolled BP will start this year, with a longer follow up, thereby creating not only a huge data base for safety but also for efficacy. This will ultimately allow us to judge the place of renal denervation in the treatment management”. The topic of renal denervation was also addressed by Prof. Tsioufis in his Presidential Lecture by an in depth review of the scientific background of renal denervation in his talk on the “Nervous system and hypertension: Pathophysiology and therapeutic horizons”. Another important topic related to renal arteries was devoted to the European Fibromuscular Dysplasia (FMD) registry, one of the leading activities of the ESH WG on Hypertension and the Kidney. Currently, the registry includes over 800 patients from 15 countries. “This has been an amazing experience, as many actively recruiting centers were not known to us beforehand”, said Prof. Alexandre Persu, Brussels (Belgium) the chairperson of the WG. “Large and small arteries are at the center of hypertension” stated Prof. Pierre Boutouyrie, Paris (France) chairperson of the ESH WG on Vascular Structure and Function. In several presentations, and in a very successful Joint Symposium with the ARTERY Society, recent exciting data on the role of immunity and inflammation in vascular remodeling were discussed. The WG on Endothelins and Endothelial Factors, chaired by Prof. Gianpaolo Rossi, Padua (Italy) presented data on endothelium-related mechanisms in the pathogenesis of chronic kidney disease (CKD) and outlined future challenges on how to assess endothelial function in patients with CKD. Novel vascular and prognostic aspects were further discussed in presentations endorsed by the WG on Hypertension and Sexual Dysfunction, chaired by Prof. Margus Viigimaa, Tallinn (Estonia). Among the activities of the new WG on Hypertension and the Heart, chaired by Prof. Enrico Agabiti-Rosei, Brescia (Italy), preliminary results of the ESH Research Project on the management of arterial hypertension in patients with high blood pressure and atrial fibrillation were presented. Several important practical issues related to obesity associated hypertension were the focus of the WG on Obesity, Diabetes and High Risk Patients chaired by Prof. Vasilios Kotsis, Thessaloniki (Greece). These included the measurements of BP in obese children and adolescents. This was in line with the sessions of the ESH Working Group on Hypertension in Children and Adolescents devoted to the importance of obesity in adolescents and young adults organized by Prof. EmparLurbe, Vice-President of ESH, Valencia (Spain) and her colleagues. Further presentations were also devoted to pediatric hypertension during the ESH 2018 meeting. Prof. Bonita Falkner, Philadelphia (USA), a world-leading expert highlighted the fact that there are only limited data available as to how hypertensive target organ effects the brains of children and raised the question of whether treating hypertension from adolescence would achieve improvement in subsequent cognitive outcomes. Among several exciting basic research data presented, Doctor Helen Warren, London (UK) gave a talk of special interest during the congress. She presented new results from the largest genetic analysis of BP to date conducted by a team lead by Prof. Mark Caulfield, London (UK). The analysis included over 1 million individuals and identified 535 novel genetic regions. There are now over 1,000 independent genetic signals that associate with BP. Prof. Dominik Müller, Berlin (Germany) who was the recipient of the 2018 Björn Folkow Award, gave a fascinating award lecture entitled “Can we treat Cardiovascular and Metabolic Disease by treating the Gut”. He showed that high salt and fat consumption affects our microbes. He presented the first promising experimental evidence generated by his group that probiotic treatment might improve BP control and cardiovascular health under high salt conditions. In the future, “we have to increase our efforts to evaluate whether this concept might be also helpful for humans” he stated. 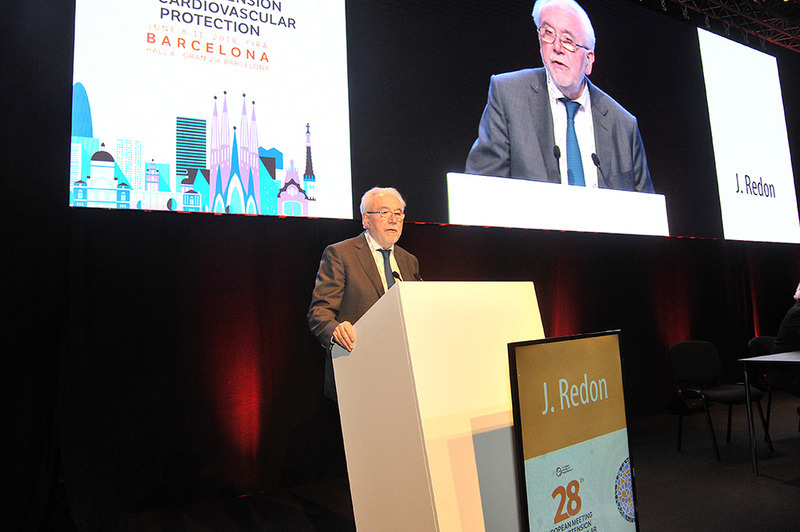 The 28th Annual Meeting on Hypertension and Cardiovascular Protection in Barcelona achieved the main goal of the ESH, that is to reduce hypertension-induced morbidity and mortality. This is done via promoting excellence in research, education and clinical practice through the 12 ESH WGs, 38 Affiliated and Associated National Hypertension Societies and 190 ESH excellence centers. Collaboration with ESC is mostly important and is underlined by the recent 2018 Joint Guidelines for Hypertension. With the contribution of all the ESH members and by innovative up-to-date strategies, the ESH addresses current challenges and is empowered to promote care in hypertension. 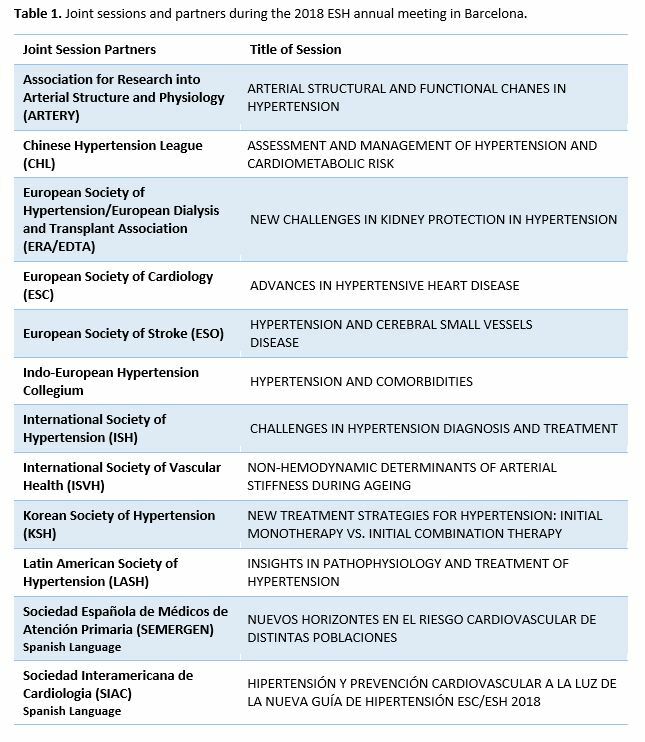 Along this roadmap, the ESH is looking forward and to welcome you to our next, the 29th Annual Meeting on hypertension and cardiovascular protection in Milan, from June 21 to 24, 2019. Williams B, Mancia G et al. 2018 ESC/ESH Guidelines for the management of arterial hypertension: The Task Force for the management of arterial hypertension of the European Society of Cardiology and the European Society of Hypertension: The Task Force for the management of arterial hypertension of the European Society of Cardiology and the European Society of Hypertension. J Hypertens. 2018;36:1953-2041.